Boca Grande tarpon fishing will be upon us soon enough. Now is the time to look at your calendars and start planning your trip of a lifetime for the majestic silver king. Boca Grande Pass is one of the best locations to target tarpon. Nestled between the crowded cities of Sarasota and Ft Myers is our little slice of paradise. Tarpon begin arriving to our area in April. By May, there’s more tarpon here than imaginable. It’s not uncommon to see acres of rolling tarpon off the beaches of Boca Grande, Englewood, and Captiva. May and June are the peak times to catch Boca Grande tarpon but we’ll begin targeting tarpon in April and continue through July. We have this term known as “hill tides” that we use when talking about the “best” tarpon fishing times. These are some of the biggest tides that we’ll see throughout the year. We’ll see about a 2ft range of tide, which for our area is quite substantial. The dates below are Boca Grande’s hill tides for 2018. Starting about mid day, the tide will begin to rage out of Boca Grande Pass…carrying crabs, threadies, and other food the tarpon sit waiting to devour. We usually begin these trips around 2 or 3pm and fish until sunset. It’s not uncommon to hook 10 fish during these trips. So if you’re looking to get into some Boca Grande tarpon action, give us a call today to secure your date for this tarpon season! Redfish are the hot bite right now around Boca Grande and Charlotte Harbor! Fish in the upper 30″s are being caught regularly. Keep your eyes peeled for that waked up water while cruising around the flats of Charlotte Harbor. Toss just about any bait or lure towards them and you’re sure to hook up. Boca Grande fishing is on fire. We’ve been seeing some better sized sea trout in the past week. Fish upwards to 20″ have been common around Bull Bay. Snook are also plentiful. Live bait has produced the most fish. The easiest way to find bait now is to look along the beaches of Boca Grande and Little Gasparilla Island. One cast lands you enough bait for days. The snapper and grouper bite is still holding strong out of Boca Grande and Englewood. There are a lot of smaller fish nearshore so you may need to push out a few extra miles to find those bigger fish. Whitebait and pinfish are top snapper and grouper baits. Artificial lures such as a Johnson silver minnow have been producing just as many fish as live bait. Drop the lure to the bottom and jig it up and down. Bam! Fish on! 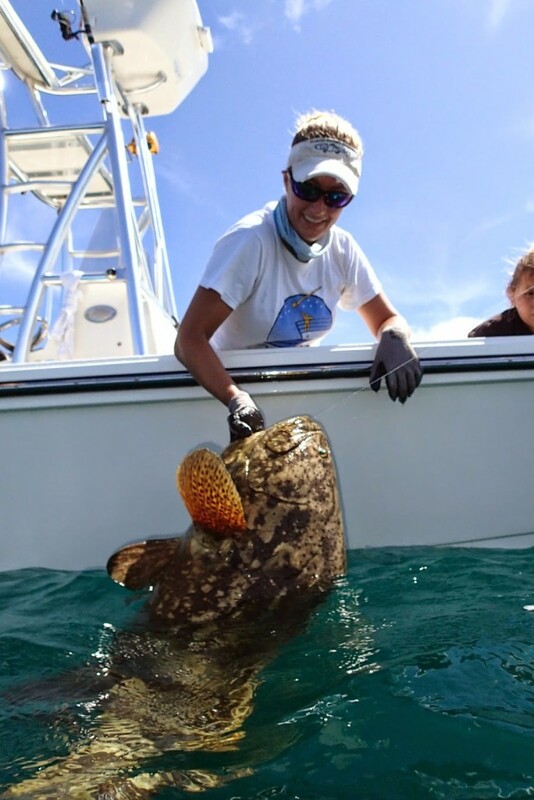 The world famous Boca Grande goliath grouper…can you handle it’s power?!? It is by far the most powerful fish you will ever encounter. With our Penn International 70 set on full lock, it is you against the beast! If any of these Boca Grande fishing charters sounds like a great time to you, give us a call and we’ll put you on your dream fish! The nearshore fishing off Englewood and Boca Grande Florida has been pretty stellar these last couple months. We’ve had our share of fishy dinners and it is a 100 times better than anything you can buy in a restaurant! Snapper and grouper are the top menu item when we start heading out in to that deeper water. The good news is you don’t have to go far if you’re looking for a quick snapper dinner. Most of the nearshore artificial reefs (within 5 miles) have good sized snapper schools on them right now. Do not park directly on top of the reef but position your boat near the structure so the tide carries your chum back to it. In addition to chum bags, we’ve been cutting up small pieces of frozen sardines and mixing that in to our chum slick. Soon, snapper will begin coming up in your slick. I like to tie on a small hook (2/0 or 3/0 circle) and free line a piece of cut sardine in to the mix. Fish on! Get that fish to the boat quick or the local barracuda will enjoy that snapper before you even get a chance. If you’re looking for that grouper dinner instead, you will most likely have to travel out a little further. 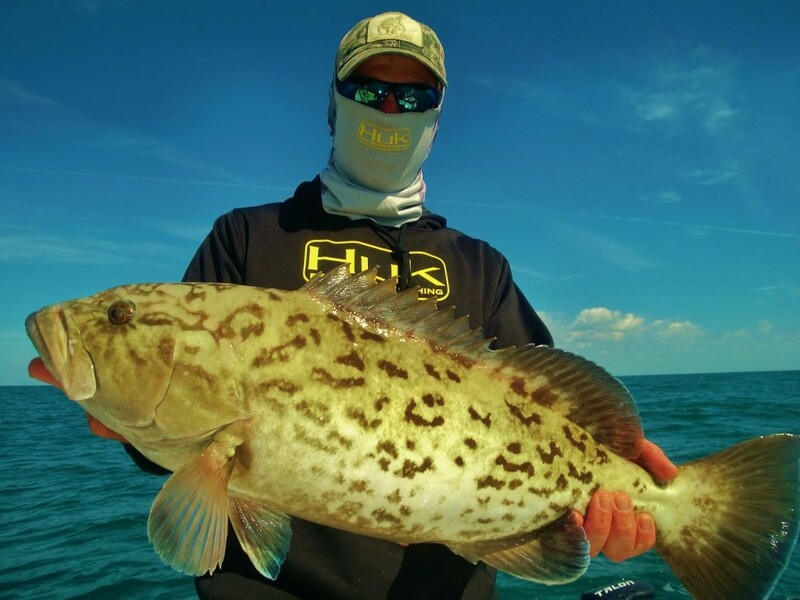 Many of the artificial reefs will hold gag grouper but with the season being opened for nearly a month now, it could make for some slim pickins. We have the best luck on private numbers that we have found…rock piles, hard bottom, ledges, etc. These areas get fished much less than published numbers. If you don’t have any numbers, start looking! Watch your bottom machine as you are running and keep an eye out for a sudden change in depth. This often signals ledges. Circle back around and check the area. Drifting is another technique used by many on a calm day. There is a lot of scattered hard bottom the further out you get. Many times when we are fishing in the 25-30 mile range, we will fish as the boat drifts. We use a traditional bottom rig with a 5 or 6oz lead, 3-5ft leader, and 7/0 or 8/0 circle hook. If you still aren’t able to secure your own fishing spots, give us a call and we’d love to take you out for an exciting day on the water! We’ll teach you how to better understand your bottom machine, what types of rigs to use, what baits we suggest, and much more! On a side note, tarpon season is still going strong if you’re looking to hook in to a last minute Boca Grande silver king. The goliath grouper bite has been even better. Our lovely customers caught 12 yesterday! If you want to catch one of these beasts, look no further. Also, our snook fishing has been pretty good. We’re starting to see more redfish in the inshore waters as well. Toss out live freelined white bait or soak cut pinfish or ladyfish and you’ll be certain to hook up. The trout bite has been really good…especially throwing topwater in the morning. A popping cork with a shrimp or white bait also works well for those toothy guys. Keep an eye out in and around the passes for those “fun fish” aka ladyfish, jacks, mackerel. Well folks, that about sums up our fishing in and around Boca Grande, Fl. If you want to get out on the water and enjoy some of the finest fishing Florida has to offer, give us a call at 941-698-0323 and talk with captains Jesse or Kelly to set up your fishing adventure. Look us up on our webpage Florida Inshore Xtream charters and read our reviews on TripAdvisor to get to know us and our business better. We look forward to fishing with you! It’s that time of year already! Over the past few weeks, the tarpon have been steadily arriving. 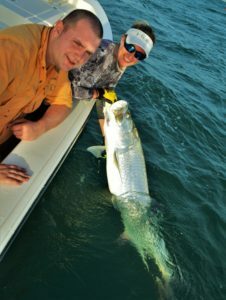 We’ve been catching tarpon in Boca Grande Pass using both conventional and spinning gear. Both crab and shrimp have been productive baits. Within the last week or so, we’ve been seeing the tarpon move to the “hill” inside Boca Grande Pass and also out to the beaches. In the coming days, expect to see even more tarpon arriving and filling the beaches. We have a few days left for this year’s Boca Grande tarpon season so if you are looking for a guide to put you on a silver king, give us a call and we’ll make your dream come true. Goliath grouper have still been productive. We’ve been averaging 250-300lb fish with an occasional 400-450lb giant. 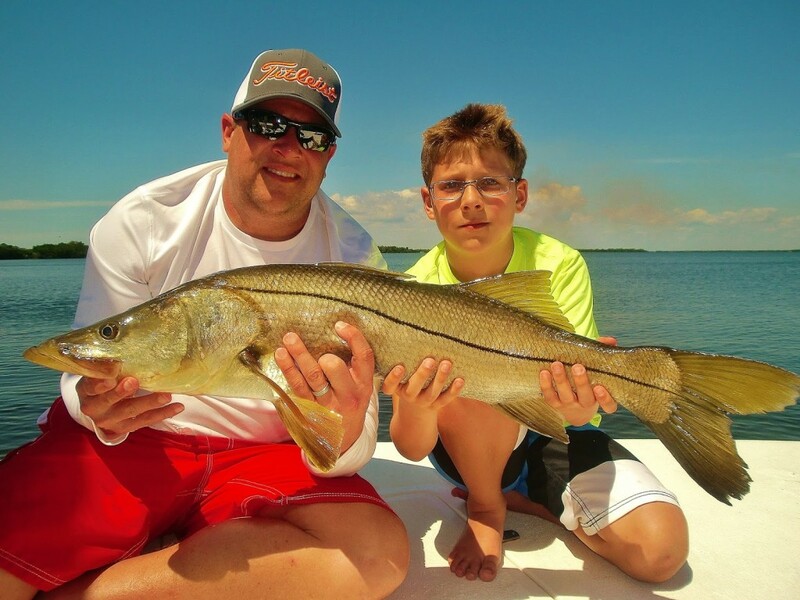 Inshore fishing has been productive with the schoolie snook. They seem to be about everywhere there’s moving water. Look around creek mouths and areas with heavily moving water. The big girls are out there too. Many of the outside bars are holding big snook and redfish. They’ve been hitting on whitebait and pinfish as well as artificial lures such as a jig head with a Mirrolure lil John or topwater baits. Our favorite lure of choice are Heddon’s spook plugs. Remember to match the bait size. If you see the snook chasing mullet, I wouldn’t recommend throwing the spook jr. Throw a larger lure that will mimic what they’re feeding on. The snapper and grouper bite offshore has still been consistent. 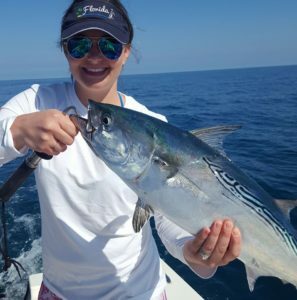 Keep an eye out for those pelagic species…king mackerel, cobia, bonito, tuna…around those bait schools and always have a rod set aside and ready for pitching baits to these fish. Also, some of the reefs are holding big permit. Have a shrimp or crab at the ready in case you see them surface near your boat. If you’re looking to find new products to make your fishing experiences more productive and enjoyable, look no further than the many companies that we like to promote. Spring is well under way and the fishing has been pretty good! Redfish, snook, trout, tarpon, shark, goliath grouper, spanish mackerel…you name it and we’ve probably been catching it. 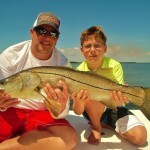 Inshore: Snook seem to be about everywhere we look lately…from the little schoolie guys to the big 40″ gals. 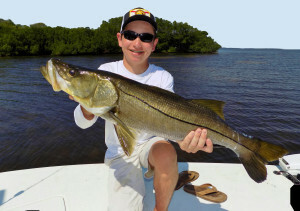 Find those areas with good moving water and you’re sure to find snook. Check the outside bars around Bull and Turtle bays. Spanish mackerel, ladyfish and jacks…aka fun fish…are plentiful. Watch for birds and look around the passes on a moving tide to find these fish. Offshore: The wind has slacked enough these last couple days to get out and catch mangrove snapper, lane snapper, red grouper and gag grouper. An occasional king mackerel has been caught as well while snapper fishing. Always have a rod ready to pitch to passerby pelagics. 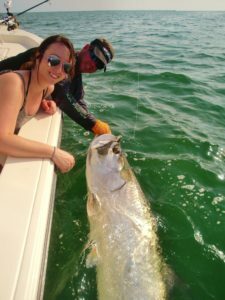 Boca Grande BIG FISH: Tarpon. Tarpon. Tarpon. For the new visitors, it’s time to see why Boca Grande is called “tarpon capital of the world.” The number of tarpon is increasing daily and the bite has been good. We have limited dates left, so give us a call to book your Boca Grande tarpon fishing charter today. We’ve been catching some BIIIIIG goliath grouper these last couple weeks. With the fluctuating weather weeks ago, changing water temps, and dirty water, the goliath grouper have moved around some and smaller fish (100-200lbs) have moved in to our usual target locations. We looked around and found where some of the big ones have moved to…our big fish of last week weighed in at 470lbs based on length/girth measurements and IGFA calculations! If you want to catch a fish that weighs double…or even triple your weight…don’t hesitate to give us a call! We will put you on the biggest fish you have probably ever caught. 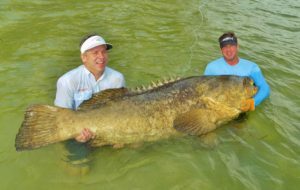 A picture with a Boca Grande goliath grouper is sure to make all your friends jealous. Things seem to be stabilizing again after last week’s cold front. Inshore: Charlotte Harbor water temperatures are back around 70. Trout are still being caught in the potholes around Whiddens and Bull Bay using a Bomber saltwater grade paradise popper with a shrimp or whitebait. Redfish and snook have been caught cruising the flats and up under the mangroves later in the day with a freelined bait. White bait and pinfish have been working equally well. Ladyfish and spanish mackerel can be found outside Turtle Bay along the bars, as well as outside the other bays and towards Boca Grande Pass. Nearshore: Keep an eye out for birds. Spanish mackerel have been within a couple miles of the beaches of Englewood and Boca Grande. We’ve been seeing large schools of bonito out in the 7-9 mile range. Try to determine their direction of travel and get ahead of them. Sometimes they can be finicky in what they eat, but this past week they were hitting anything we threw at them. Keep an eye out for kingfish as well around the bait pods. The snapper and grouper bite has remained consistent. A jighead tipped with shrimp or white bait has been our go to rig recently. Big Fish forecast: Tarpon are trickling in Boca Grande Pass. The weather seems to have the larger goliath grouper pushed around a bit but we are still catching ones in the 150-200lb range. Warming waters will bring them in soon enough so go ahead and give us a call to book your Boca Grande tarpon or goliath grouper charter. We only have a handful of days open through June so don’t wait too long! Are you ready for a fresh grouper dinner? The nearshore fishing off Englewood and Boca Grande Florida has been pretty stellar these last couple months. We’ve had our share of fishy dinners and it is a 100 times better than anything you can buy in a restaurant. 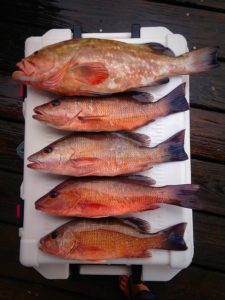 Snapper and grouper are the top menu item when we start heading out in to that deeper water. The good news is you don’t have to go far if you’re looking for a quick snapper dinner. Most of the nearshore artificial reefs (within 5 miles) have good sized snapper schools on them right now. Do not park directly on top of the reef but position your boat near the structure so the tide carries your chum back to it. In addition to chum bags, we’ve been cutting up small pieces of frozen sardines and mixing that in to our chum slick. Soon, snapper will begin coming up in your slick. I like to tie on a small hook (2 or 3 ott circle) and free line a piece of cut sardine in to the mix. Fish on! Get that fish to the boat quick or the local barracuda will enjoy that snapper before you even get a chance. If you’re looking for that grouper dinner instead, you will most likely have to travel out a little further. Many of the artificial reefs will hold gag grouper but with the season being opened for nearly a month now, it could make for some slim pickens. We have the best luck on private numbers that we have found…rock piles, hard bottom, ledges, etc. If you don’t have any numbers, start looking! Stop and look at your bottom machine anytime you pass crab pot buoys or see large schools of bait. These are sometimes indicators of good bottom. If you still aren’t able to secure your own fishing spots, give us a call and we’d love to take you out for an exciting day on the water! We’ll teach you how to better understand your bottom machine, what types of rigs to use, what baits we suggest, and much more! On a side note, tarpon season is winding down but a few fish are hanging around if you’re looking to hook in to a last minute silver king. 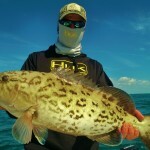 Goliath grouper around Boca Grande Pass have been gobbling up all sorts of baits. If you want to catch one of these beasts, look no further. We’ve caught 8 or 9 fish each trip this past week. Also, our snook fishing has been pretty good as well. In and around the passes are great areas to look. Toss out live freelined white bait or soak cut pinfish or ladyfish and you’ll be certain to hook up with a linesider. Well folks, that about sums up our fishing in and around Placida, Fl. If you want to get out on the water and enjoy some of the finest fishing Florida has to offer, give us a call at 941-698-0323 and talk with captains Jesse or Kelly to set up your fishing adventure. Look us up on our webpage Florida Inshore Xtream charters and read our reviews on TripAdvisor to get to know us and our business better. We look forward to fishing with you! Fishing this summer has been hot, hot, hot! 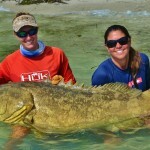 We’ve been doing a lot of nearshore and goliath grouper fishing. Published reefs, as well as hard bottom and ledges, have been producing a lot of decent snapper and grouper. Don’t forget chum…after establishing your drift and anchoring, begin chumming to get those fish fired up. In no time, you should have snapper swimming under your boat. In this case, free line a 4/0 circle hook with a well hidden shrimp or piece of cigar minnow and allow to sink down to snapper. For bottom fish, use a standard bottom rig with a live bait. Pinfish, squirrelfish, and threadfins have been working quite well. Keep an eye out for those large bait schools because it could also point you in the direction of pelagics such as jacks, tuna, or kingfish. If you aren’t able to sabiki up any live bait, frozen cigar minnows and sardines have also been successful. Driving out 20 miles isn’t necessary if you are just looking for a little family fun and fish for dinner. We’ve been fishing within 9 miles and our customers have been enjoying delicious meals of mangrove snapper and gag grouper. 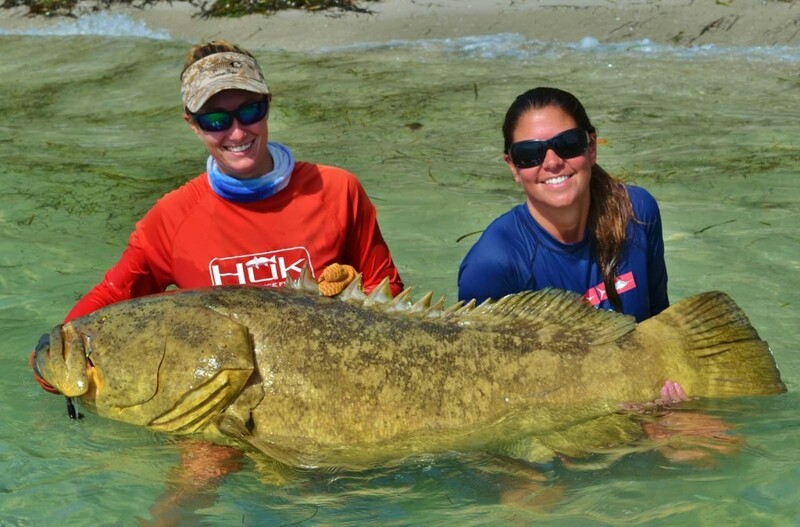 If you are looking to hook into a large and powerful fish…goliath grouper is the way to go. We have been catching several goliaths on each trip. Nearshore reefs and wrecks are loaded with these giant beasts. 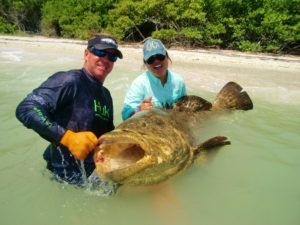 If you have the appropriate gear, toss on a live jack…or for that matter…just about anything, to hook into the largest grouper in the Gulf of Mexico. If you don’t have the right equipment but still want to catch a goliath, give us a call and we can make that happen. Reeling in one of these fish is a memory of a lifetime. If you have any questions, feel free to give us a shout and we’ll give you the best advice possible.